This article is about public holidays in the United Kingdom and Ireland. For the bank holiday declared in the USA during the Great Depression, see Emergency Banking Act. For the film, see Bank Holiday (film). A bank holiday is a public holiday in the United Kingdom, some Commonwealth countries, other European countries, and a colloquialism for a public holiday in Ireland. There is no automatic right to time off on these days, although banks close and the majority of the working population is granted time off work or extra pay for working on these days, depending on their contract. The first official bank holidays were the four days named in the Bank Holidays Act 1871, but today the term is colloquially used for Good Friday and Christmas Day which were already public holidays under common law and therefore not official bank holidays in England, Wales and Northern Ireland. Until 1834, the Bank of England observed about 33 saints' days and religious festivals as holidays, but in that year this was reduced to four: 1 May (May Day), 1 November (All Saints' Day), Good Friday and Christmas Day. In 1871, the first legislation relating to bank holidays was passed when Liberal politician and banker Sir John Lubbock introduced the Bank Holidays Act 1871, which specified the days in the table below. Under the Act, no person was compelled to make any payment or to do any act upon a bank holiday which he would not be compelled to do or make on Christmas Day or Good Friday, and the making of a payment or the doing of an act on the following day was equivalent to doing it on the holiday. The English people were so thankful that some called the first Bank Holidays St Lubbock's Days for a while. Scotland was treated separately because of its separate traditions: for example, New Year is a more important holiday there. The Act did not include Good Friday and Christmas Day as bank holidays in England, Wales, or Ireland because they were already recognised as common law holidays: they had been customary holidays since before records began. In 1903, the Bank Holiday (Ireland) Act added 17 March, Saint Patrick's Day, as a bank holiday for Ireland only. New Year's Day did not become a bank holiday in England until 1 January 1974. Commencing in 1965, on an experimental basis, the August Bank Holiday weekend was observed at the end of August "to give a lead in extending British holidays over a longer summer period". Each year's date was announced in Parliament on an ad-hoc basis, to the despair of the calendar and diary publishing trade. The rule seems to have been to select the weekend of the last Saturday in August, so that in 1968 and 1969 Bank Holiday Monday actually fell in September. A century after the 1871 Act, the Banking and Financial Dealings Act 1971, which currently regulates bank holidays in the UK, was passed. The majority of the current bank holidays were specified in the 1971 Act: however New Year's Day and May Day were not introduced throughout the whole of the UK until 1974 and 1978 respectively. The date of the August bank holiday was changed from the first Monday in August to the last Monday in August, and the Whitsun bank holiday (Whit Monday) was replaced by the Late Spring Bank Holiday, fixed as the last Monday in May. In 1978 the first Monday in May in the rest of the UK, and the final Monday of May in Scotland, were designated as bank holidays. In January 2007, the St Andrew's Day Bank Holiday (Scotland) Act 2007 was given royal assent, making 30 November (or the nearest Monday if a weekend) a bank holiday in Scotland. Under the Banking and Financial Dealings Act 1971, bank holidays are proclaimed each year by the legal device of a royal proclamation. Royal proclamation is also used to move bank holidays that would otherwise fall on a weekend. In this way, public holidays are not 'lost' in years when they coincide with weekends. These deferred bank holiday days are termed a 'bank holiday in lieu' of the typical anniversary date. In the legislation they are known as 'substitute days'. The movement of the St Andrew's Day Scottish holiday to the nearest Monday when 30 November is a weekend day is statutory and does not require a proclamation. A number of differences apply in Scotland relative to the rest of the United Kingdom. For example, Easter Monday is not a bank holiday. Also, although they share the same name, the Summer Bank Holiday falls on the first Monday of August in Scotland, as opposed to the last Monday in England, Wales, and Northern Ireland. Despite this, it is custom and practice to follow the rest of the UK and banks close on the last Monday and not the first. Bank holidays do not, however, assume the same importance in Scotland as they do elsewhere. Whereas they have effectively become public holidays elsewhere in the United Kingdom, in Scotland there remains a tradition of public holidays based on local tradition and determined by local authorities (for example, the Glasgow Fair and the Dundee Fortnight). In 1996, Scottish banks made the business decision to harmonise their own holidays with the rest of the United Kingdom, with the result that 'bank holidays' in Scotland are neither public holidays nor the days on which banks are closed. The number of holidays in the UK is relatively small compared to many other European countries. However, direct comparison is inaccurate since the 'substitute day' scheme of deferment does not apply in most European countries, where holidays that coincide with a weekend (29% of fixed-date holidays) are 'lost'. In fact, the average number of non-weekend holidays in such countries is only marginally higher (and in some cases lower) than the UK. Worth mentioning is that public holidays in Europe which fall on Thursday or Tuesday typically become "puente" or "bridge" four-day or even six-day extended holiday weekends as people tend to use one or two days from their holiday entitlement to take off Monday and/or Friday. There have been calls for more bank holidays. Among the most notable dates absent from the existing list are the feast days of patron saints; 23 April (St George's Day and widely regarded as the birthday of William Shakespeare) in England and 1 March (St David's Day) in Wales are not currently recognised. 17 March (St Patrick's Day) is a public holiday in Northern Ireland and, since 2008, 30 November (St Andrew's Day) is a bank holiday in Scotland. St Piran's Day (patron saint of Cornwall) on 5 March is already given as an unofficial day off to many government and other workers in the county, and there are renewed calls for the government to recognise this as an official bank holiday there. After the election of the Coalition Government in May 2010, the Department of Culture, Media and Sport launched a pre-consultation in 2011 which included the suggestion of moving the May Day Bank Holiday to October, to be a "UK Day" or "Trafalgar Day" (21 October) or to St David's Day and St George's Day. It is suggested that a move from the May bank holiday to a St Piran's Day bank holiday in Cornwall, on 5 March, would benefit the Cornish economy by £20-35 million. During the sterling crisis of 1968, Prime Minister Harold Wilson convened a meeting of the privy council in the early hours of 14 March to declare 15 March a non-statutory bank holiday. This allowed the UK government to close the London gold market in order to stem the losses being suffered by the British pound. It was this meeting that triggered the resignation of Foreign Secretary George Brown. In the past, additional one-off bank holidays have included: (i) Wednesday 14 November 1973, to celebrate the Wedding of Princess Anne and Captain Mark Phillips at Westminster Abbey, (ii) Tuesday 7 June 1977, to celebrate The Queen’s Silver Jubilee, (iii) Wednesday 29 July 1981 to celebrate the wedding of Prince Charles and Lady Diana Spencer at St. Paul's Cathedral,  (iv) Friday 31 December 1999 to enable people to prepare for the festivities to mark the arrival of the new millennium. [decimal 6] (v) Friday, 29 April 2011, to celebrate the wedding of Prince William and Kate Middleton. 1 2 3 4 5 6 7 When the stated date falls on a Saturday or Sunday, the following Monday is normally designated a public holiday instead. When Christmas Day falls on a Saturday (and thus 26 December on a Sunday), Monday 27 December and Tuesday 28th December are the designated substitute public holidays. ↑ In 1995 this holiday was moved to 8 May – to commemorate the 50th anniversary of VE Day. ↑ In 2011 an additional public holiday was declared in order to ensure that most people would have a chance to celebrate the Wedding of Prince William and Catherine Middleton, making a four-day weekend as May day was on the following Monday. "Royal Wedding: Prince William and Kate set date". BBC. 23 November 2010. Archived from the original on 24 November 2010. Retrieved 23 November 2010. ↑ In 2002 this holiday was moved to 4 June. This caused it to follow an extra bank holiday on 3 June, making a four-day weekend to celebrate the Golden Jubilee of Queen Elizabeth II. ↑ In 2012 this holiday was moved to 4 June. 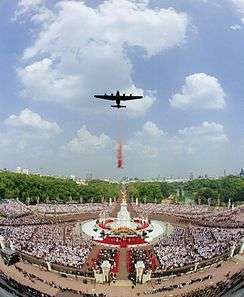 It was then followed by an extra holiday on 5 June, making a four-day weekend to celebrate the Diamond Jubilee of Queen Elizabeth II. ↑ House of Commons Hansard Written Answers for 3 June 1998, Hansard, 3 June 1998, retrieved 28 January 2012 . New South Wales has a "Bank Holiday" on the first Monday in August — for bank employees only. Tasmania has a "Bank Holiday" on Easter Tuesday — for bank and government employees only. In Hong Kong, the term "bank holiday" is used colloquially to refer to public holidays, since banks are normally closed on these days. Hong Kong has maintained a distinction between public holidays and statutory holidays; the number of days for the latter is fewer. In India, 15 of the public holidays are bank holidays. In Ireland, "bank holiday" is a colloquial term, sometimes used incorrectly for what are officially "public holidays". A bank holiday in Ireland are only days in which Bank employees are off, e.g. Good Friday is a Bank Holiday, but not a Public Holiday. ↑ "Bank holidays and British Summer Time : Directgov - Government, citizens and rights". Direct.gov.uk. 29 April 2011. Archived from the original on 15 May 2011. Retrieved 17 May 2011. ↑ "UK bank holidays - GOV.UK". gov.uk. 17 March 2014. Retrieved 9 April 2014. 1 2 Anon (22 May 2007). "Bank Holiday Fact File" (PDF). TUC press release. TUC. Archived from the original (PDF) on 3 June 2013. Retrieved 12 January 2010. ↑ One or more of the preceding sentences incorporates text from a publication now in the public domain: Chisholm, Hugh, ed. (1911). "Bank Holidays". Encyclopædia Britannica. 3 (11th ed.). Cambridge University Press. p. 320. ↑ Olmert, Michael (1996). Milton's Teeth and Ovid's Umbrella: Curiouser & Curiouser Adventures in History, p.170. Simon & Schuster, New York. ISBN 0-684-80164-7. ↑ "Bank Holidays (Ireland) Bill". Hansard, the Official Report of debates in Parliament. UK Parliament. Archived from the original on 24 February 2010. Retrieved 26 March 2010. ↑ "Bank Holiday On The Last Monday In August". The Times Digital Archive. 5 Mar 1964. Retrieved 21 June 2013. ↑ "1969 Dilemma on Diary Dates". The Times Digital Archive. 27 Jan 1967. Retrieved 21 June 2013. ↑ "Bank Holiday Dates For 1967 And 1968". The Times Digital Archive. 4 June 1965. Retrieved 21 June 2013. ↑ "1969 Bank Holidays". The Times Digital Archive. 22 Mar 1967. Retrieved 21 June 2013. ↑ Morrow, Thomas. "Bank Holidays a history". Bank Holidays a history by Thomas Morrow. Retrieved 27 September 2011. ↑ "Renewed call for St Piran holiday". BBC News. 5 March 2009. Retrieved 26 April 2010. ↑ Gledhill, Ruth (5 March 2009). "Cornwall workers given an unofficial day off for St Pirans Day". The Times. London. Retrieved 31 March 2010. ↑ "Cornish National Holiday worth £35m". Western Morning News. 23 November 2011. ↑ "Statesman who bottled out: 'Tired and Emotional: The Life of Lord George Brown'". The Independent. 9 May 1993. ↑ "Public Holidays Act 1993 (Vic) s. 9" (PDF). Victorian Legislation and Parliamentary Documents. Parliament of Victoria. Retrieved 23 May 2015.